We have Teamed Up with ‘Fresh-Start Motorcycle’ Rider Training. From Learner-Legal C.B.T and A2 to Direct-Access ‘Full-Power’ and even taking it to a Higher Level ‘Advanced Rider-training’. 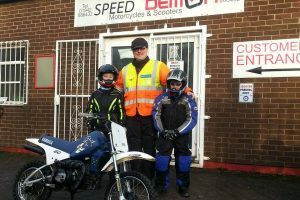 We are DVSA Approved and probably have the Highest Trained Rider Instructor’s in the area again with the best Facitities and Training-ground thats the closest to the Areas DVSA Test Centre in Atherton. Vitally Important ‘As you only get what you Pay for’… we are the Best Quality & Value . Either call in store or send us a message using the form below. Website built & maintained by Tubado.